Today, we have put together free photohop UI kits in once place. Are you tired of spending hours in making mockups of web pages where you can use web UI elements again and again? If you are a designer with more and more projects of web design and other graphic design work, you definitely would have tired. Undoubtedly, every web designer has spent many endless hours mocking up web pages. So, in my opinion, every web designer must have set of Photoshop UI kits to save his precious time and spare headaches.Free Photohop UI kits are very very useful for web designers. It is a good practice to have a UI kit at hand so that its application into the project could be made possible by customizing it. I am here to help you in reducing your effort of creating UI elements. I have compiled this list of psds and vectors of UI elements that would help you in making your web design process faster. You would find here any Photoshop UI kit that matches your taste and for free. Once again I’ve killed some time and therefor another free psd. Simply hit the attached .psd & don’t forget to follow for further shots! This was a rejected client work, so I decided to share it with the awesome Dribbble community. All items are 100% customizable vectors. Feel free to use it the way you want, for personal or commercial use. As you can see this kit is really beautiful, you can make magic wireframes using this mobile wire framing kit. Why waiting? Go and grab it, you can download it below. The source file is well layered PSD File. This week’s freebie is a bright and colourful flat UI kit, including everything buttons and menus to form elements and media controls in a striking Magenta and Teal colour scheme. All of the elements are completely editable and scalable in Photoshop, and updating the colours is a breeze. This jQuery plugin simplifies the usage of Bootstrap Pagination. This user interface kit takes a dark, modern look and feel. It contains various “user profile” elements (images, avatars, bio sheets), a map/about section, social media sharing, and various other elements. Freebie Dribbble app concept is a free UI design resource made by Dribbble user Mark / HipstaCowboys. As far as I can tell, its license is Free for Commercial and Personal Purposes. Helpful hint: Dribbble users are nice. If the license is unknown, it is usually because they forgot to mention it explicitly; not because they were being stingy. Ask nicely and they will probably allow you to use it. Flatastic Mobile UI Kit is a large user interface kit containing hundreds of mobile ui elements, which will help you design mobile apps in Photoshop with ease. Dark UI is a set of crafted UI for Bootstrapee users. It is free and comes with 5 menus, 3 drop-down and mega menu, side menu and panel, single profile and contributors’ profile, 2 contact forms, 2 login forms, video player, 4 upload sections, app link sender and input status. Flat Winter UI Kit is a free UI Kit design resource made by Dribbble user Zachary VanDeHey. A Photoshop template of GUI elements found in the public release of iOS 7. Play Music Player is a user interface music player inspired to Saavn. Free PSD created by Dhiren Adesara. Today’s freebie comes from Mertcan Esmergül. He designed a great Gmail UI Kit, that is made completely of Photoshop shapes which allows you to re-size any element. As always, this freebie comes fully layered and is editable. Heard you like freebies, so I’ve made a freebie and here is the freebie which is as free as freebie. Another flat, modern UI kit to start designing your own website. You’ll find lots of elements and components included in the PSD file, all build with editable, fully-scalable vector shapes. Download, share and enjoy! We have another UI Kit for you today. This one is colourful, vibrant, and tactile. It contains various form, navigation and interface elements, with lots of variety. Provided in grey, red, and orange — it’s a solid starting point for any dark user interface design. Here is a special one for you. An eCommerce UI kit with a wide variety of elements designed to fit perfectly for a fashion shopping website. The complete kit that contains more then 100 vector UI elements can be found on PixelKit.com, the only place that has all the premium UI kits & design resources you need to rock your next design! Use this lovely UI kit to design your own application or website. The PSD file includes different UI elements build with fully scalable vector shapes. Released by Marie Dehayes. We have another cracking freebie for you today! Created by Polish designer Radek Jedynak, it is flat styled widget UI kit with a nice and simple pastel color scheme. The UI kit is called Ero, comes in PSD format and can be freely used in your personal or commercial projects. After some feedback and refining, the UI kit is finished! Learned a lot making this (like the importance of pixel snapping). PSD is included; all elements are 100% vector for infinite scalability. If you’re extra thirsty, check out Strawberry Milk, an alternate color scheme. In today’s freebie, we present a free apps UI kit PSD template, Thalium. This is a lite version of huge Thallium GUI Kit for apps and web designers. You can use all objects absolutely for free. Just some of objects are vector shapes here, all other are rasterized. Compatible with Photoshop CS3, CS4, CS5 and CS6. All object are vector shapes with ability to unlimited scaling, reshaping and applying any effects and color schemes. Often tasked with data visualization at myplanet, @Aaron Legaspi put together a template to use. Full size png attached. Here is another UI component I did about a week ago, and it’s finally pre-packed for this releases… I’m calling this one “web w3rk” for the obvious reasons, its more for website being that it includes a slider layout.. most of the componets has a small screen effect which make this kit really umique, besure to check out the high resolution preview image before you guys download it. Download this PSD UI kit to help you design your application faster. The gorgeous player and the outline icons match perfectly with the new flat design trend. Enjoy all the graphic elements available in this freebie, because they are scalable PSD vectors and that means you can use them for web or print at any size or resolution. Re UI is a free UI design resource made by Dribbble user Seven. As far as I can tell, its license is Unknown. ou are currently viewing Blueberry UI Kit Freebie [PSD], a free UI Kits design resource made by Dribbble user Noah Zwillinger. Up for grabs is a free PSD UI kit designed by Alex Patrascu. The file is fully layered and very well organized to make it easy to work with. Alex did a fantastic job of including a lot of the common elements needed when designing a website or app. This Awesome UI Kit from Freepik.com is massive and a fantastic way to ease into flat design. Perfect for a host of projects, the UI kit is unashamedly neutral, providing a framework for your own design, not dictating your approach as a lot of UI kits do. A great range of UI components are included: boxes, paginators, product ratings elements, blog elements, and all manner of e-commerce goodness. Minimize UI Kit is a very basic PSD that can be a great starting point when creating your own design. All elements are in vector format so you can resize to fit your own needs. Ui kit you can try different colors with s. sharing a useful, In order to create responsive sites. An easy on the eyes UI kit best used for a coffee shop, bistro or pastry website. An easy pick if you want your website to make an amazing impression. It comes with 100+ elements in 6 different categories that will help you knock your website out of the park. This one came out really nice, I have been working on this for almost a week in-between the other .PSD I released in the past week, I call this one Rich & Beautiful UI for the obvious reasons. All layers are completely editable vector shapes, and its pretty well organized. The font I’m using is called Aovel Sans, you can download that here it is free. I’m not really big on UI, and it seem like all has been made already, especially Flat Color UI’s, but I gave this a shot, I’m still using some flat colors with gradient effect, you can check out the full size preview below along with the .PSD download link. I have been working on this one since Saturday, I finally fished it. I’m not sure why I picked the color Purple, I guess it’s spin I haven’t seen yet? or maybe I liked the Purplish blurred background I started with? either way I like the end result, hope you guys like it too? I’ll add more detail later tonight, I have to run out for a bit, you can download the .PSD below, and the larger preview right below the download button. Here is another UI Components I did earlier this week, I’m calling it “Neo” don’t ask why. All the elements are in vector shape so you can adjust the size, colors rotation etc… as a bonues I also added it a 3D ext effect that can be edited via smart object. Website is the first mode of communication with your potential customers and clients and thus the web designing elements that you choose need to exactly reveal the purpose of your business. Clean & Usable UI Kit can make your website look great and visually appealing. Instead of paying thousands of dollars to the web designers, there are several UI elements available for free downloading from the internet. This kit is quite eye-catching and impressive and can save a lot of effort and time for the web designer. Using the elements of the kit, you can create an effective and informative website which could easily transform the visitors into customers of your business. Another week went by and it’s time for another freebie from our clean UI kit that can be found on PixelKit, the only place that has all the premium UI kits & design resources you need to rock your next design! UI design Kits are very useful to speed up your Project, You can use User interface kits to wire frame your projects. In this Red User interface Kit you can find some good elements like Dropdown menus, Form Elements, Progress bar, timeline .. We can’t say it is completely a flat style UI kit but based on flat style design. We really love the simplicity of flat style elements. This UI bundle includes Buttons, progress bars, radio buttons, 50 different kinds of icons, warning boxes, players, content box.. As you witnessed the UI bundle is a very neat and clean design. The source file is in PSD format and it is well layered. All elements are well scalable vector shapes. You can find the download link below. Enjoy!! This huge Free flat style UI kit contains different styles of Menus, Dropdown lists, Buttons, Form Elements, Check boxes and radio buttons, Toggle, Navigation and Paginations, Tags, Alert Boxes, progress Bars, Login forms, Contact Forms, weather Widgets, Calendar Widgets, Social Buttons, Media players, Attachment, Profile Elements. Flat style UI kits are very popular and good UI kits are Expensive too. But There were quite a number of free flat style UI kits were released last month. This post covers the latest free flat style UI kits released last month. Many web designers spend their lots of time on crafting web elements. So, here is the first flat media UI Kit PSD which is completely free to download for all those web designers. This free media UI kit have almost all the media elements you will need. You can use it in your next project or can get inspired before starting your new project. A hotel UI kit that will help you create cool designs and web layouts aimed at hotels, B&B’s, vacation websites and other similar ventures. The modern look and the wide variety of elements specifically designed for this hotel niche will get you everything you need at the length of a simple click. We are getting good responses for our UI design freebies; today we are giving away a small free mobile application UI kit as a start. You can see the free Mobile Application UI Kit screenshot below; as you can see it is very minimal and included some basic things. a much bigger mobile UI is coming next month. You can grab the source file from the below download link. Solid UI Kit is a fresh design created by Alvin Thong from Sixbase. The download includes a well organized, easily editable PSD file. The Cloudy UI kit is very simple and modern and would work well in any typical website design. The wide array of elements makes this kit very useful. This UI kit is clean, with just a slight bit of texture. It is very minimal, but the texture adds an extra element that makes it appealing. This UI kit is clean and crisp with a nice amount of contrast to make it stand out, even on dark surfaces. The subtle colors and the sharp edges make this UI kit nice for adding depth and dimension to your work. This is a very clean and light UI kit that you could adapt to any user interface. The midnight UI kit is a highly professional dark UI kit that contains many common elements found in most user interfaces. Create a professional chat user interface with this UI kit. This transparent UI kit is beautiful and really stands out. This would work well on a website with a colorful background, like the one shown in the screenshot above. Free Photoshop UI kits are meant to save your time.Your productivity would enhance by using free photohop UI kits. 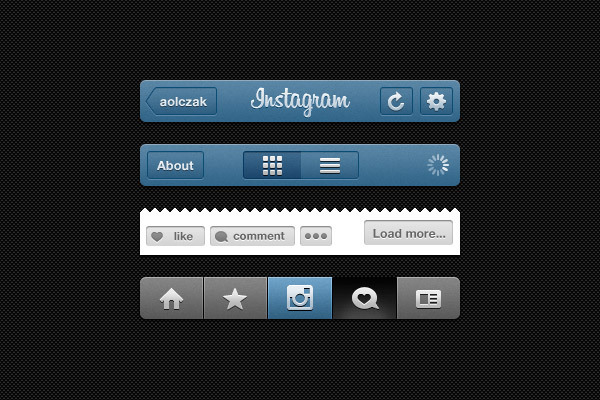 These UI kits would enable you to focus on aesthetics. If you use free photohop UI kit, your worries about the mechanics of creating each element in a precise manner would go. So stop wasting too much time on creating UI elements. You have a huge resource of free Photoshop UI kits in your pocket now. If you have liked this collection of free Photoshop UI kits, don’t forget to share it with your fellow designers. We need your help in spreading the word about this great resource of free Photoshop UI kits. Very useful article for the those who are really interested in photoshop and photo editing.